Why has the time spent studying declined so sharply in the United States over the the past few decades? 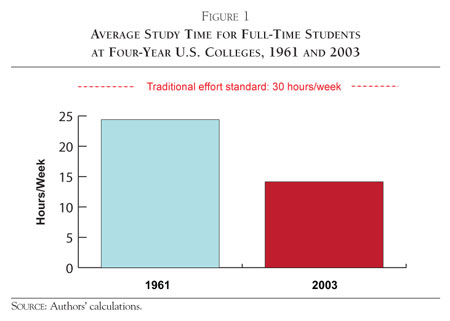 Study time for full-time students at four-year colleges in the United States fell from twenty-four hours per week in 1961 to fourteen hours per week in 2003. The decline is not explained by changes over time in student work status, parental education, major choice, or the type of institution students attended. Evidence that declines in study time result from improvements in education technology is slim. A more plausible explanation is that achievement standards have fallen. I wonder why the time spent studying has declined so sharply in the United States over the the past few decades. I am only looking for data-supported answers (or pointers to them). First, it is important to deploy your scientific skepticism in assessing this claim. The source, after all, is the American Enterprise Institute, which is a political "think tank" that is explicitly dedicated to pushing a particular point of view. Other key elements of its scientific record including taking tobacco company money to produce pro-smoking studies the 1980s and recent attacks on global warming. A shift in faculty requirements away from teaching and toward research, with a concomitant decrease in the amount of work that faculty are able to support asking from students. From the early 1980s to today, however, the situation appears to have been more stable. In 1961, one could easily get a good job paying a reasonable salary with the possibility of continued promotions without going to college. This is much less true in 2003, so many people are going to college not out of interest but as a default choice. Hence, while the population going to college in 1961 did so because they were interested in academics, many of the people going to college in 2003 don't actually want to study. Hence it is not surprising that, on average, they study less. As much as I'd like to leave this as a comment, I just can't. So here's a semi-rant but very informative piece of an American student's experience, and why we don't spend as much time studying as we may have 20-30 years ago. As a full-time student with parents who have fallen into essentially infinite debt due to tax and bankruptcy laws, I have zero financial support in college. My tuition and living expenses are about $18,000 per year and yet, amazingly, my federal + state aid totals about $12,000 per year (and this is 90% loans!). Yay America! I had academic excellence scholarships my first two years, but when I transferred universities I lost the ability to obtain scholarships; the reason remains obfuscated to me to this day; universities are businesses! So where does that leave me? Approximately $6,000 per year in deficit to my institution. I am incredibly fortunate to have chosen a major which has led me, after two years of hard work, to have two part-time jobs at approximately $14/hour each after taxes. I work these two jobs a total of 30-40 hours per week in order to pay off this deficit. Now, imagine a full-time student who is in class 15 hours per week, with 10-20 hours per week of homework, working 30-40 hours per week to pay for school. The total? Approximately 60 hours per week spent on school and work, and not counting study time. I satisfy the minimum requirements for my courses and work - I do my homework and work and pass my tests; believe me, I'd love to spend time studying more what I care about, but time does not permit. I am a lucky one in that I seemingly absorb information like a sponge and I don't have to spend time studying in order to satisfy university requirements. Others? They unfortunately have to spend 10+ hours per week studying to remember what they learned. The point is, Americans in general have more financial assistance nowadays than before; ironically, the cost to students is much higher. Thus, many students like me need to work to afford school (even after taking out the maximum of federal loans per semester). In needing to work to afford school, we become trapped in a self-fulfilling prophecy - students study less, care less about school, and drop out more, even though the cost (economically and personally) is more. I study less because I have to do more to be able to go to school. I know that many others are in the exact same situation as me: less time caring about school and more time working part-time minimum-wage jobs to afford the ever-increasing tuition and living costs. This is the current state of American public higher education, and it is not fun. Edit: The issue of financial aid and taxes was brought up in the comments on this answer, so I'd like to talk about that in terms of the typical student. This is the opposite of free money. Loan servicers make thousands of dollars off the interest. In my particular case, I receive $0/year in scholarships because I transferred universities and am no longer eligible to receive them; I receive about $1,500 per year in grants (the Pell Grant, specifically) because my parents make decent but not great money (middle class Americans); I borrow $10,500 per year in federal loans, and I fund the other $6,000 or so with my own personal finances. The problem is that when this deficit occurs - when #1-#3 don't cover the entire cost of tuition + living expenses - it's up to the student or their family to pay it, and on time. Unfortunately, you can't just owe the university money when you graduate and pay it like a medical bill over time. You have to pay it up front or you don't get to register for classes; incidentally, if you don't register for classes for 6 months, you have to start paying your loans! Like my family, the $6,000 per year to cover one child's education just isn't there. Most families I know don't even have $1,000 to spare, including mine. Thus, the student must take on the additional responsibility of working - and working a lot - because most jobs available to undergraduate students pay minimum wage. With some basic math, at $8/hour a student would need to work 15 hours/week year-round in order to make $6,000 to pay university costs. That is not time spent studying. Even if I received the $6,000 per year in scholarships I was receiving at my first institution, I would still be borrowing $10,500 per year in loans. 4 years of that and the total debt after interest nears $47,000 and the interest continues to accrue during the repayment period. I am fortunate to be majoring in Computer Science, so I have very good job prospects to pay back such a balance. Others may not be so fortunate. As James mentioned in a comment, it seems that I was implying that we should increase the available financial aid (which would mostly be loans). In fact, we should instead work to solve the crisis of public education in America by reducing tuition costs. As mentioned, taxes play a big part in that. I'm no expert, but it seems to me that cutting our $600 billion military budget by $50 billion to add to our currently $70 billion education budget would immediately solve a lot of problems for American students. Relieve the pressure from students to put themselves tens of thousands of dollars in debt to get a bachelor's degree and maybe we would have more time to study. But I'll leave that project to the budget board that drives the future of our country. I'm surprised nobody seems to actually be examining the paper itself. I expect most here are academics, and this is a study after all. I did this and already found potential issues. I'm sure as you dig in further, you will find more to question. Like any study, one must first find potential flaws and address then with a follow-up study. The authors are examining surveys from several time periods done by different organizations. There is very much a potential for framing effects, i.e. the way a question is asked can bias the answer. The authors then seek to remedy this by taking variations on the survey questions and asking them to current students at a single major university in California. They then use the variation in answers and use that to adjust the results of the surveys. 1) it addresses only the framing effect and introduces its own flaw, which is that they are randomizing across students today at a single university in California. There's no reason to believe that a student from 1961 from a different university would answer the same question in the same manner as a student from 2010 from that particular university. 2) In fact, I'm skeptical that they properly addressed the framing. As I looked into how the datasets were gathered, I found they were gathered in very different ways and I can't imagine how you could remedy this by just giving students randomized survey questions at the end of class. For example, the time-use survey from 1965 was done by asking respondents to keep a diary. Then this was followed-up by an in-person interview. Would results gathered in this way differ than asking people to fill out a form at the end of class? In fact, it's well-known that one way to bias a study is to ask people to keep careful records. By asking people to think whether they spend their time doing X, you actually influence the time they spend on X. In this case, I imagine asking students to keep track of their study time would definitely affect the time they spend studying! Given these issues that arose immediately from just a quick glance at the paper, I would say one should keep a skeptical mind about these types of research papers, especially when the authors don't make it easy to refute their claims; I wasn't able to find the survey questions they used, for example, to address the framing effect, nor did I find any discussion of how they addressed the differences in data gathering or record keeping. Most established tragically low expectations. President George W. Bush’s 2002 education reform, “No Child Left Behind,” only worsened this problem. It set the impossible requirement that 100% of students be “proficient” in reading and math by 2014, and punished schools that weren’t making adequate progress. To bring themselves closer to 100%, many states simply lowered the score needed to pass their tests. The result: In 2007, Mississippi judged 90% of its fourth graders “proficient” on the state’s reading test, yet only 19% measured up on a standardized national exam given every two years. In Georgia, 82% of eighth-graders met the state’s minimums in math, while just 25% passed the national test. A yawning “honesty gap,” as it came to be known, prevailed in most states. I know at the community college where I teach, a combination of pressure for higher graduation numbers, and also concern for students holding full-time jobs and caretaking families, has over time led to simplified coursework and fewer outside homework assignments. Why would the students of 1961 spend more time "studying" than students today? In 1961 in the US, there was military conscription. Students who flunked out could be drafted and sent into the combat zone. In addition, many universities had mandatory ROTC. When your ROTC instructor plows through, it is better for you if you are studying than if you are goofing off. If you can goof off with a book in your hands, you are "studying". In some respects, it has always been so. With the possible exceptions of the postal service and the motor vehicle bureau, few public institutions rival our schools in public dissatisfaction. “We can all agree,” according to the conservative magazine The Weekly Standard, “that American public schools are a joke”—and it is not hard to find comparable statements from commentators on the left. In think the answer given that states "standards have fallen" - which is mentioned by your study authors is pretty much the reason. However, there is a bit more to it - at least at a guess. For example, here in the UK, successive governments have been league-table obsessive with the deranged expectation that the performance of schools and students can be measured accurately. Along the way, GCSEs are also graded based on statistics where the most frequent mark is a middle C and the rest are arranged around it - this means worse performance by all does not result in worse marks. But coming back to the league tables and rankings: A bit issue of ranking is that nobody wins when someone does badly but everybody wins when they do well. Exam boards have no incentive to provide hard papers, as schools prefer to pick the easy one - for a good ranking. In addition, the current UK system relies a lot on fairly simple tests that can be marked quickly by the teachers paid to do so (still takes months...) - from questions that guide you, to multiple choice questions (at A-level at least). Especially multiple choice questions can also be solved by deduction rather than knowledge. In addition the format of today's questions has changed a lot. In the past one may have asked you have a system with A, B, C, D work out X, Y, Z. Today you would be given a system with A, B, C, D, told to work out X, then assume it is H, continue on to Y, assume it is I and then continue on to Z. And there is technology: In the past, if students wanted to cheat, they would spend a lot of time preparing their notes somehow, however the act of preparing notes is effectively revising. Today, a student wishing to cheat would more likely try to use a mobile to google an answer. And lastly, "learning to pass the test". I guess partially due to the ubiquitous access to "knowledge" on the internet, actually learning has become less important. It has become fairly standard to learn for tests only with students "cramming" before a test and then forgetting everything later... Incidentally, simple questions that are easy to mark are a part of the problem here, if questions required and actual understanding of the problem, more time would have to be spent revising. The source article is not very clear on the definition of "study time", and it appears to be inconsistent with federal law. In order to be eligible for federal student aid, a student must be enrolled in a full time course of study. 14 hours per week of study time do not qualify as full time studying. For financial aid purposes, full time is 12 credit hours for undergraduates, or 9 credit hours for graduate students. At the school where I teach, this usually translates to taking three classes of 4 or 4.5 credit hours per quarter. Each class requires about 4-5 hours of classroom time, plus another 8-10 hours of prep/homework time, for a total just shy of 40 hours. This article claims a "study time" of 14 hours in 2003. My best guess is that they are only referring to classroom time. If that is the case, the statistics may simply indicate a shift from classroom time to homework from 1961 to 2003. There are other possible explanations. What is needed is a more rigorous definition of what this study was actually looking at. Not the answer you're looking for? Browse other questions tagged united-states reference-request working-time academic-history or ask your own question. How much vacation time is typical during a PhD in the United States? Why dissertation has no score in GPA in United States? What is a authentic source of civil engineering BS graduation rate in united states in the last few year? What time of the year do government agencies in the United States typically hand out funding? Can anonymized teaching evaluations be made public in the United States? Why do we sign an agreement to adhere to the United States Constitution, before teaching at the college level?